May fourth is the international day against digital restrictions management, led by the organizations Defective by Design and the Electronic Frontier Foundation, among others. Here’s how to identify DRM, according to the EFF. “Digital Rights Management (DRM) technologies attempt to control what you can and can’t do with the media and hardware you’ve purchased. -Bought an ebook from Amazon but can’t read it on your ebook reader of choice? That’s DRM. -Bought a DVD or Blu-Ray but can’t copy the video onto your portable media player? That’s DRM. -Bought a video-game but can’t play it today because the manufacturer’s “authentication servers” are off-line? That’s DRM. 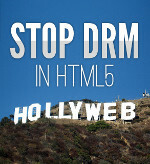 Here’s where you can find products and artists who are against DRM. And of course here on Green Comet. All files made available for download here are guaranteed DRM-free. This entry was posted in Uncategorized and tagged freedom. Bookmark the permalink. This will affect us all!